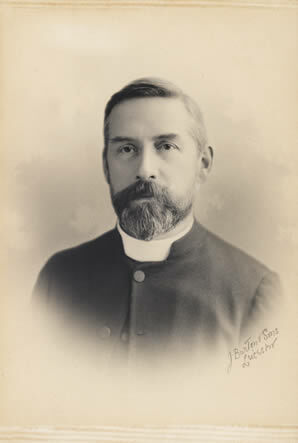 Whittingham, DD, MA was an eminent traditionalist Anglican Bishop, regarded as one of the influential Anglican Churchmen of the first half of the 20th century. He was born in Walthamstow and educated at the City of London School and Peterhouse, Cambridge, where he took the Moral Science Tripos. He was ordained deacon in 1886 and began his career a curacy at. St Margaret’s Leicester. Following ordination he moved to St. Thomas the Apostle, South Wigston first as curate and the became Vicar. He moved to Weedon, Buckinghamshire, in 1899, returning to Leicestershire as Vicar of St. Mary’s Knighton from 1904 to 1917, serving as Rural Dean for Leicester from 1915 to 1917, after which he became Rector of Glaston, Rutland and Archdeacon of Oakham. In 1915 he had been made an Honorary Canon of Peterborough from 1918 until 1922, when he moved to Peterborough Cathedral as a Residentiary Canon. A year later in 1923 he was elevated to the Episcopate as the third Bishop of St Edmundsbury and Ipswich. As a Bishop Whittingham became especially active and influential in relation to what was termed the “business departments of clerical life”, such as the reform of the Church’s finances, church building maintenance and dilapidations and the problem of clergy pensions, both within his own diocese, and nationally within the Church Assembly, though he was in a minority in his “pungent attacks” on breaks with what he regarded as central Church of England traditions, notably the revision of the Prayer Book in 1927-28 and the spread of Anglo-Catholic doctrines and practices within some parts of the Church. He retired from St. Edmundsbury after 17 years in 1940, just a matter of months before his death in June 1941. Obituary: Dr W G Whittingham: the Business Side of Clerical Life. The Times 19th June 1941, p. 7.